Here is a little background on Gordian before we get started. Gordian was a popular anime series that aired from 1979 to 1981 in Japan. There were 73 episodes in total. 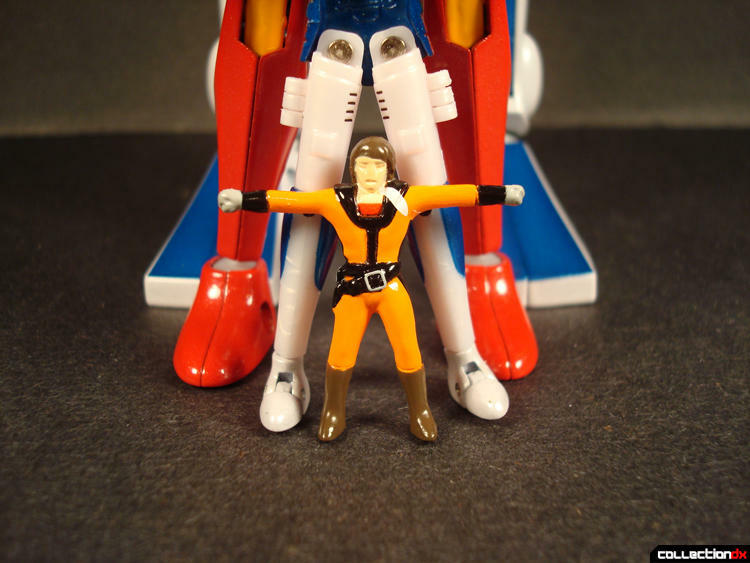 The concept was basically that the main character, Daigo Otaki, is a pilot who controls a small almost human-sized robot suit named Protteser. When Protteser is in trouble, he jumps into the next biggest robot suit named Derringar. From there, they jump into Garbin to become super powerful and get rid of all the bad guys. 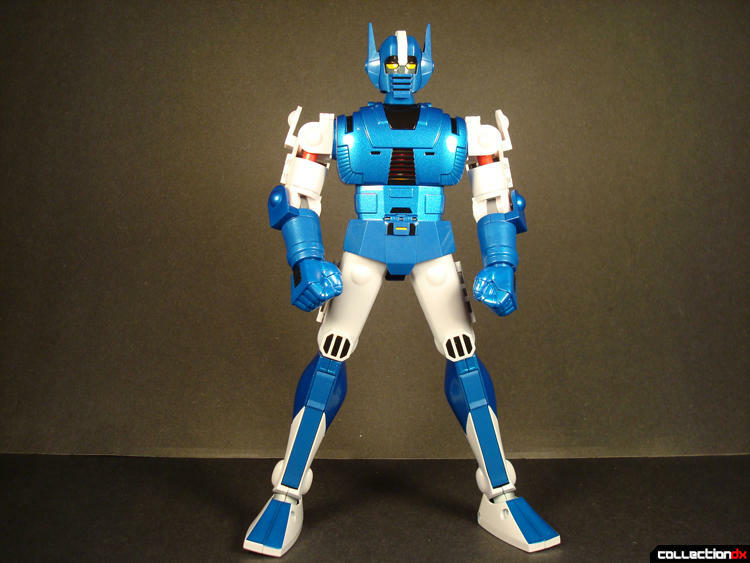 Moving on to toy, most of us have heard of, come across, or owned the Godaikin toy called Gardian. 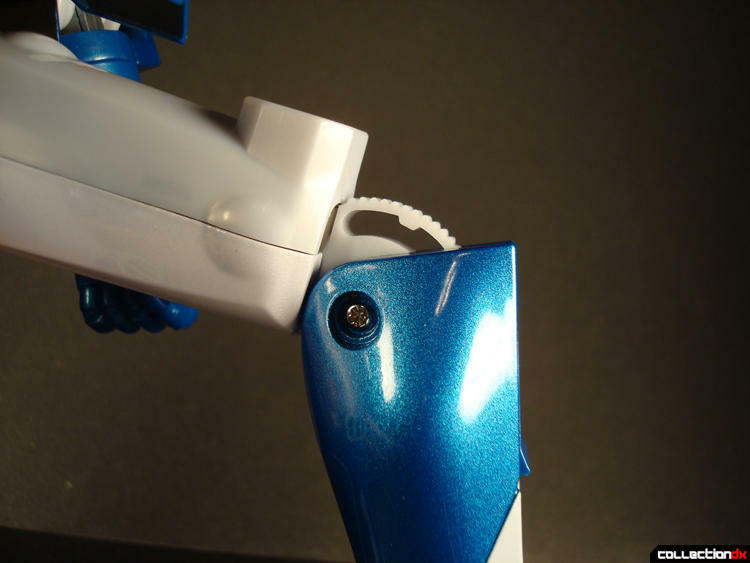 It is pretty well known for its fragile knee joints that crack because the blue plastic used on the shins gets brittle over time. So is this new CM's version the improved be-all end-all version of Gordian? Let's take a look, but first, use the bathroom, grab a snack, or whatnot: I'm going to be thorough. 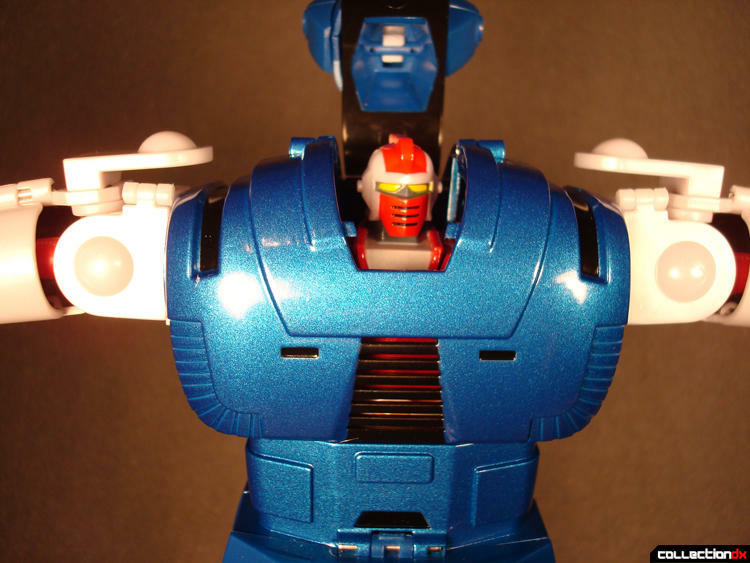 Please welcome CM's Brave Gokin 30! 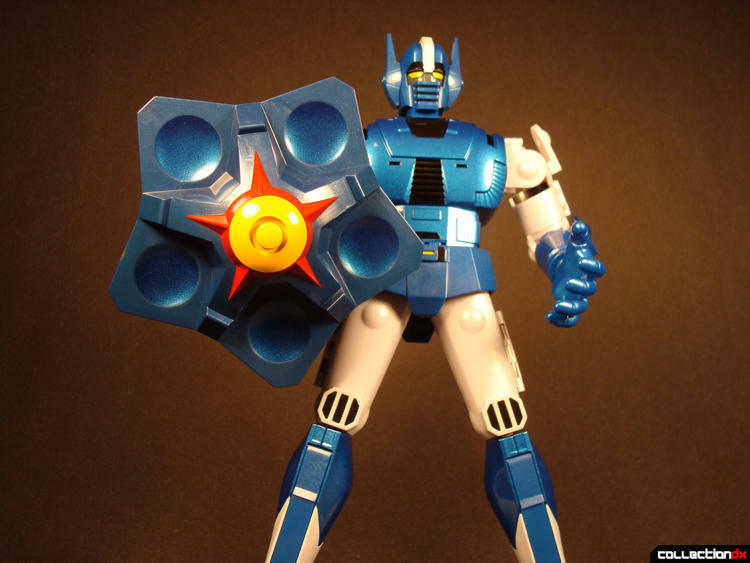 The toy shown here, however, is no ordinary CM's Gordian, it is the Limited Version. What makes this so "Limited"? For starters, there are only 150 lucky people who will own this specific version. More on that later. I would like to start off by showing the huge box this toy comes in. You'll notice this version is differentiated from the normal version by a sticker on the right side of the box. I love the style CM's has used. The box has a blue/black gradient background with a red grid design, along with some great photography and lighting effects. It's your standard CM's thin glossy cardboard special here. Once we stop salivating over the multitude of robot pictures, we can begin to dig in and pull out a huge Styrofoam tray that’s just as big as the box itself. It’s a thick and meaty 3" slab of Styrofoam just like the good ol’ days. Notice how everything is laid out. I let out an audible "WOW" when I pulled off the Styrofoam cover panel. I'm a sucker for this stuff. Everything is wrapped in plastic for its protection. Your eyes naturally gravitate to the center where Garbin is. After all, he is the biggest and hopefully the heaviest. He is well packed with Styrofoam bricks that hold him securely. Once I gathered myself, I proceeded to take Garbin out. I gasped as all my fears of him feeling too light and flimsy flew, no, shot out the window! I left him in his neutral pose which, if you know me, gives me a warm feeling inside. He's pretty tall. Take a moment to check him out. Check out the vintage style copyright info on the back. 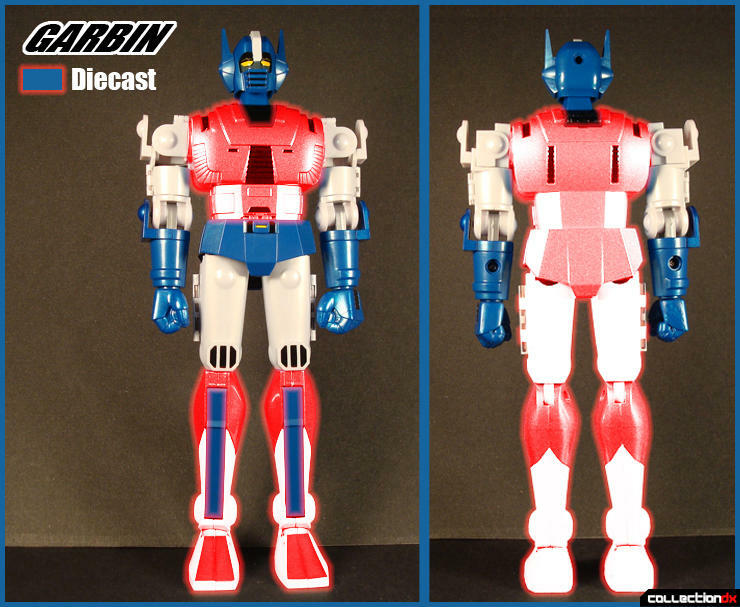 In open form, shown here, you can see the detailed interior of Garbin. 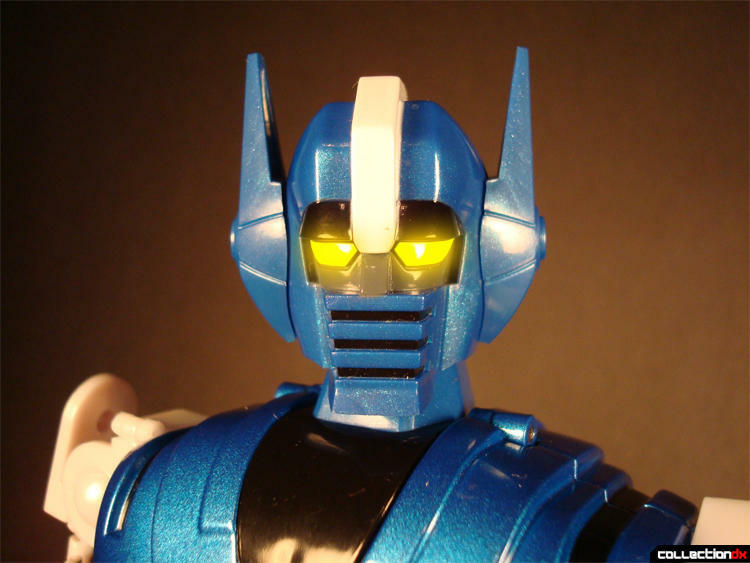 The very center of the chest has "GARBIN III" molded in, which is pretty cool. You'll also notice an assortment of small machine screws. Screws are always a good sign. Upon closing the compartments, you'll be rewarded with a satisfying click, especially from the chest section. The shoulder joint is interesting. There is a plastic arm that makes contact with the shoulder gear. Now, I'm no expert in plastics, but it almost looks like a plastic I’ve seen used in RC car gears. It might be Delrin/POM? In my experience, it is been a durable material. Maybe someone can shed some light on what this plastic is. I’ve ratcheted the arms a few times and the plastic does not seem too stressed when the arms click over the gear teeth. I am basing this on tactile feel. The hollowness of this robot makes each click louder and higher pitched than it would be if it was solid. Seeing as how easily accessible this ratchet arm is, CM's should've included a couple extra... just in case. Moving on down to the inner knees, we can see that CM's has reinforced this area with two diecast pieces. The outer knees, specifically in a bent position, show the design CM's has chosen for this area. The top of the ratchet piece connects to the inner diecast piece shown in the picture above. The teeth cause the ratcheting motion against the top of the shin. 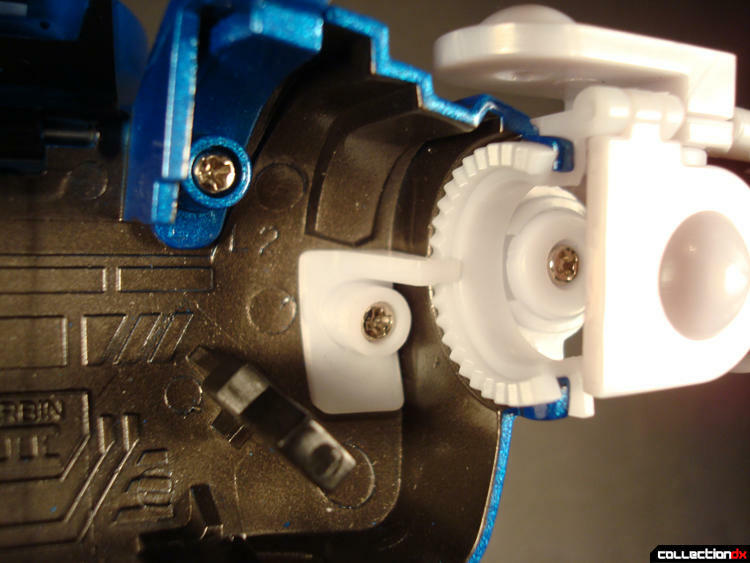 Take note how there is a reinforcement molded to the center of the gear "bridge". Natural reaction is to very carefully try and bend the knee, but it's going to take a little more than just a tug to get these knees to ratchet initially. You'll find that once you get over the initial click, the knees tend to ratchet a lot smoother. I'm going to touch on articulation a little more. 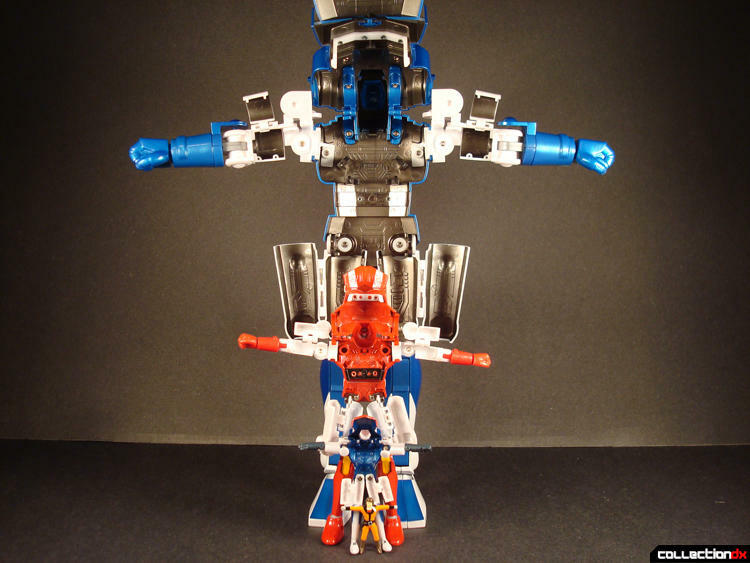 Although in the previous pictures Garbin looks a bit rigid, CM’s has managed to fit some movement to the figure. I would call it a bit compromised due to cosmetic and functional design. Forward leg articulation has been aided by working in a plastic skirt to the design. I've seated him here to demonstrate. Leg movement to the rear is very slight; the upper thighs quickly come in contact with the leg joint. Legs move outward a couple of clicks but are limited to the rear section of his skirt which is diecast and does not swing out. 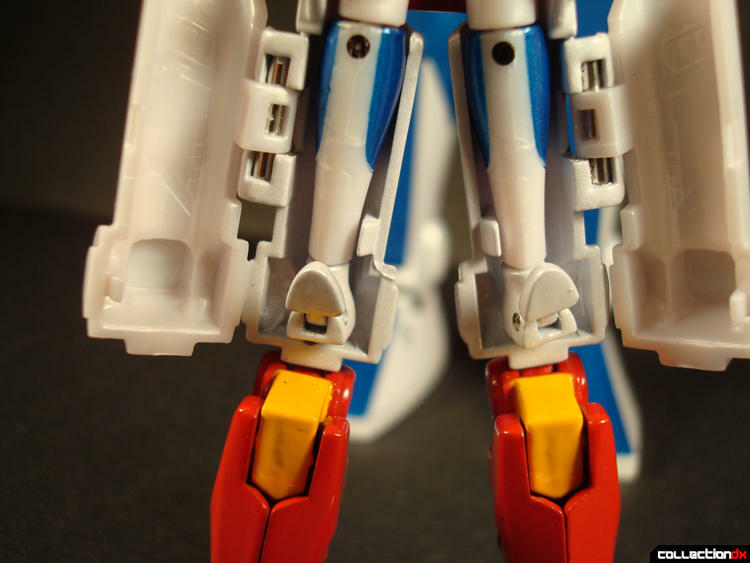 Because the upper leg joints are diecast, the legs don’t so much "click" but make a muted "clack", which feels firm and satisfying. (FIG.1) The feet are very nice and solid, but I feel they could have done more with the ankle movement. 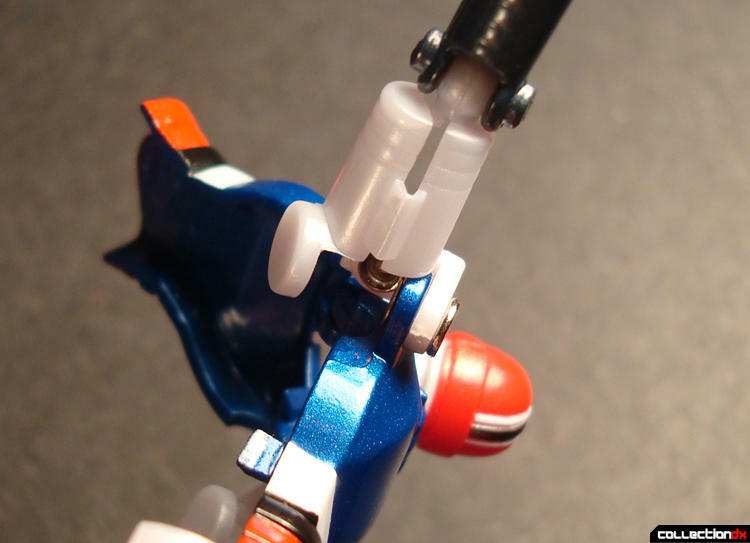 The huge ball joint is deceptive as it looks like it offers huge movement but is limited due to its cosmetic design. To be fair, the movement it provides is more than enough than needed for the limited posing ability of the figure. (FIG.2) The lower legs swing around completely. 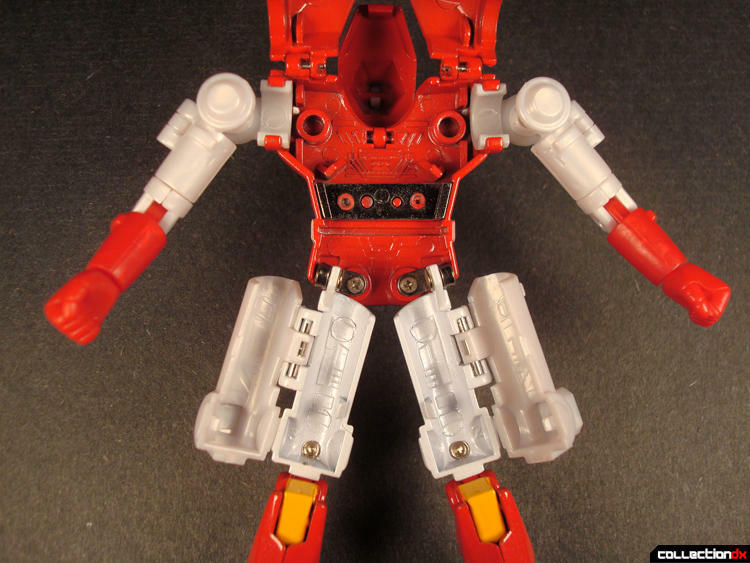 One thing you'll notice about this figure is the amount of hinges. There are hinges everywhere due to the fact that there are lots of swinging panels. 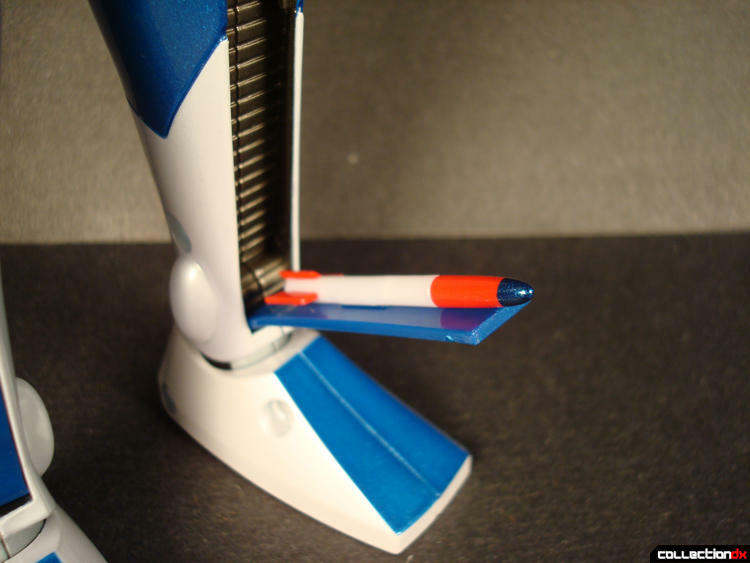 For most people, the hinges on the sides of the leg are an eyesore. I have to say though that during the short time I've owned this, I've had the feeling that CM's is really trying to give this figure a modern-vintage feel, if that makes sense. I can't help but think that they purposely left the huge hinges like that as a tribute to the Godaikin. Of course, it’s possible I am just imagining things. Moving on to the next smallest figure, we have Derringar. He bears a striking resemblance to Gaia, no? 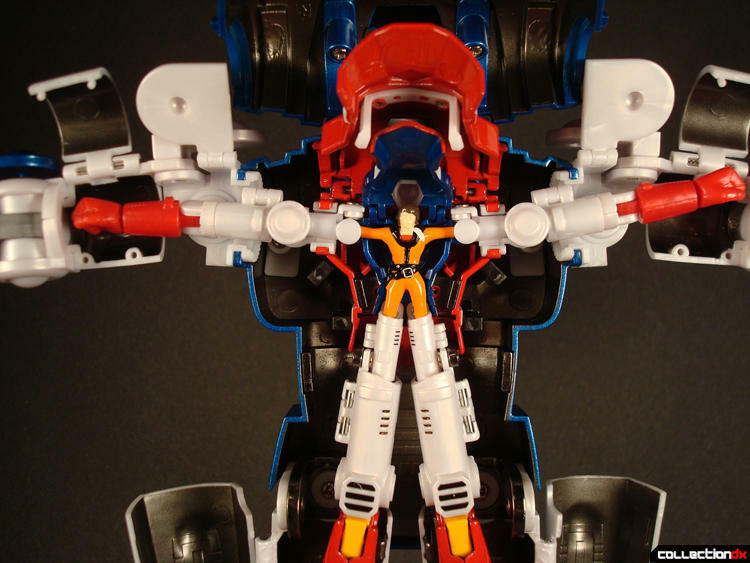 Just because this guy hides away in Garbin's chest doesn't mean CM's strips him of his gokin duties. This guy is pretty cool on his own. No flop syndrome on this guy. In the open position, shown here, we can see the design layout, which is similar to Garbin's, albeit smaller in scale. Like Garbin, his name, "Derringar II", is molded into the back half. He has no shoulder ratchets, as you can see. Instead he has a "C" shape bearing type cuff that leaves a gap for combination time. With the chest panel closed, this cuff now can spin against the opposing ridge of the chest panel. Pretty clever. Surprise, surprise, he's loaded with hinges. 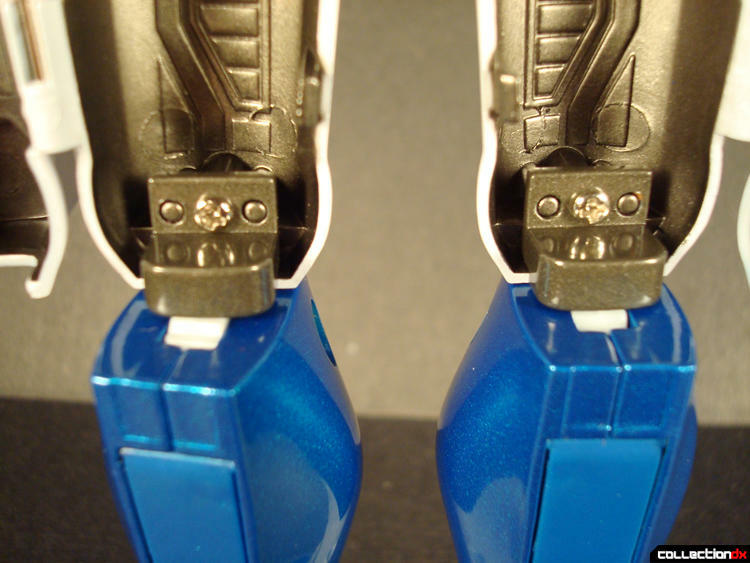 There are diecast brackets used to attach the upper thighs to the body. No ratchets anywhere on this guy. The knees are interesting as they have two joints, one up front and one directly behind it. 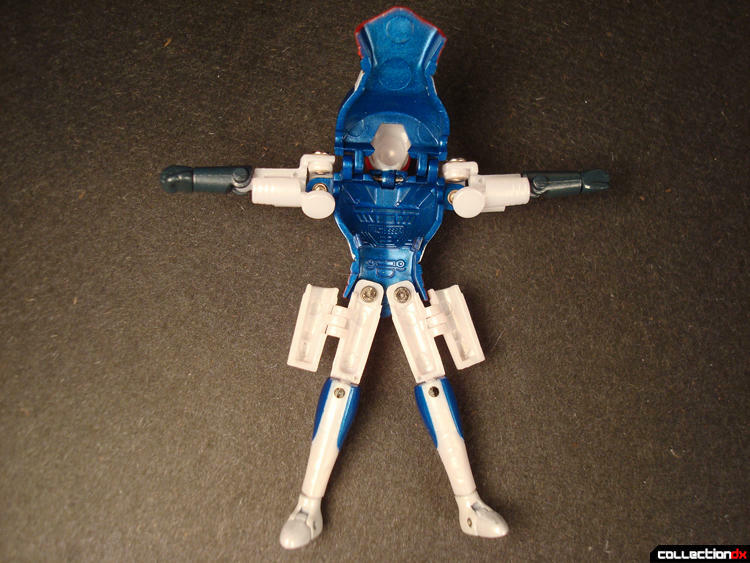 If you unfold the joints, the legs will be extended. I've yet to understand its purpose. There is small forward movement for the legs, but none towards the rear. There is a small amount to the sides, just enough to get a good stance. All the panels snap nicely into place. Molding is very precise. 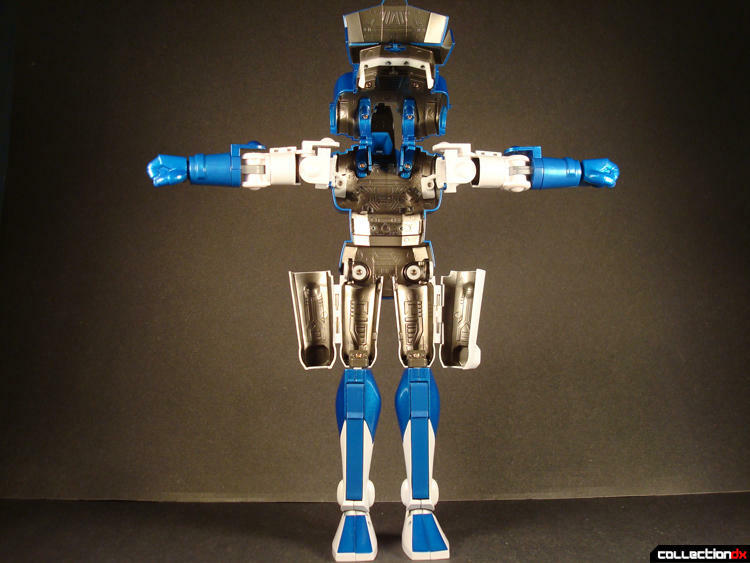 Last but not least is this little guy that resembles a robotic football player. He is charmingly small but, surprisingly, features paint apps that are sharp to the naked eye. Being so small, he doesn't suffer floppiness, but his size has required some compromises in his construction. 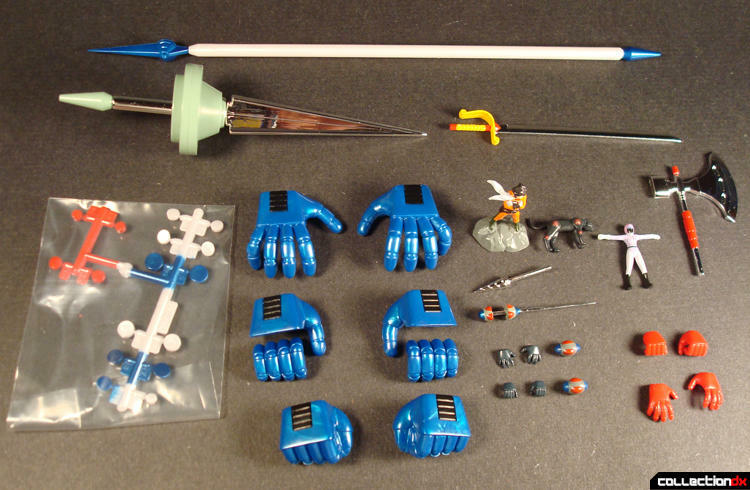 For example, there are no screws used in Protesser’s construction. They’ve pulled the dreaded folding plastic trick. Have you ever use a shampoo bottle with these folding hinge types? After a while they snap. Hopefully it will not be the case with this figure, but in a few years, or worse... months? 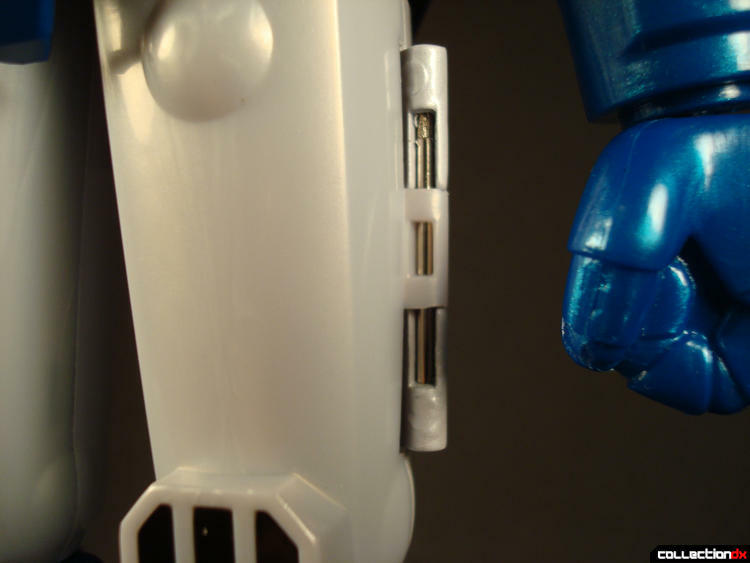 The small pilot figure is flexible enough to fit in Protesser without opening his arms, but still, a big oversight on CM's part. Hopefully they did their homework with plastic formulas. I would have preferred ugly arms with real hinges over this option. Normally, I'd just skip over something like this but, Daigo Otaki is the pilot, after all, and he is part of the combination. He is just a teeny 1.25" piece of vinyl with simple paint applications. Once you've gathered all the guys together, combination is pretty simple. You simply open up all the body panels and put each figure into the other, starting with the smallest into the next biggest obviously. Notice the size differences between the figures. Here's what they all look like placed into each other. I’ve left the panels open so you can see how the figures fit together. The only figure needing slight adjustment to fit is Protesser. You know what they say about robots with big feet? You need to fold their toes. "Hey can somebody close the hatch? I can't quite reach it." “Bapadapa pa papa papa paaaaaa!” Garbin’s looking all bad and stuff. Here you can see therange of the leg movement to the sides. I'm not going to go through all the weapons since he has many. Just the basics. Hand Spike- This is meant to replicate him using his "ears" as weapons. The actual ears on this figure are simply removed and a separate piece is used. So basically when he's upset, he takes his ears off and proceeds to stab. If only we could all be so lucky. A nice little feature is this hidden leg panel where you can store a missile. Unfortunately, it does not shoot. Instead of going over all the accessories and extra weapons, I've taken a photo of the accessories I didn't go over and all his included hands. Notice there is a more detailed figure of Daigo Otaki and a female pilot figure. If the screw holes bother you, CM's has got that covered. Here's the part a lot of you were waiting for. Although I hinted of the content before, I was very vague on purpose because I wanted to show off the rest of the features in as much detail as possible. Instead of describing the metal content, I have used a technique I use in my videos minus the sound effects. This guy is the meatiest of the bunch...well as meaty as a hollow robot can be. Very nice and heavy on his own. This guy may very well beat Garbin in the overall percentage of diecast on his body. Finally, we have the smallest of the bunch. Fortunately, CM's decided a small amount of diecast is better than none. So what makes this version so Limited? Box has "Limited Edition" sticker. 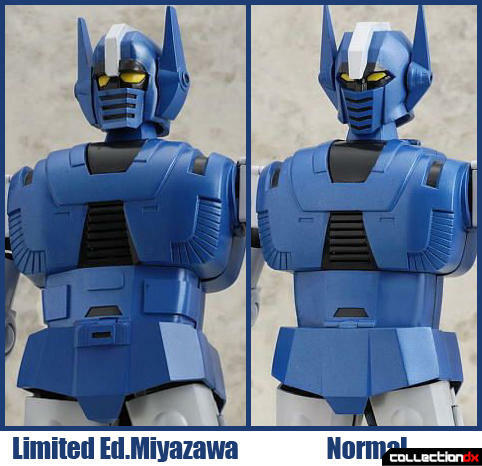 This Miyazawa version has been limited to 150 pieces worldwide. Some changes to sculpt of the body. 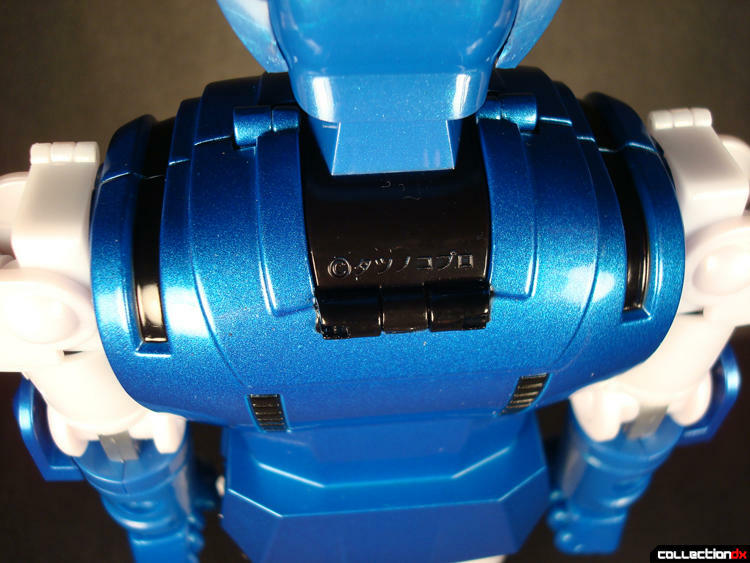 Blue color has been replaced with a metallic blue plastic and paint. White colors have been replaced with pearl white paint and pearlescent white plastic. Below, I’ve taken both versions and placed them side by side so you can see the difference of the heads and the subtle differences of the body. Which do you guys prefer? 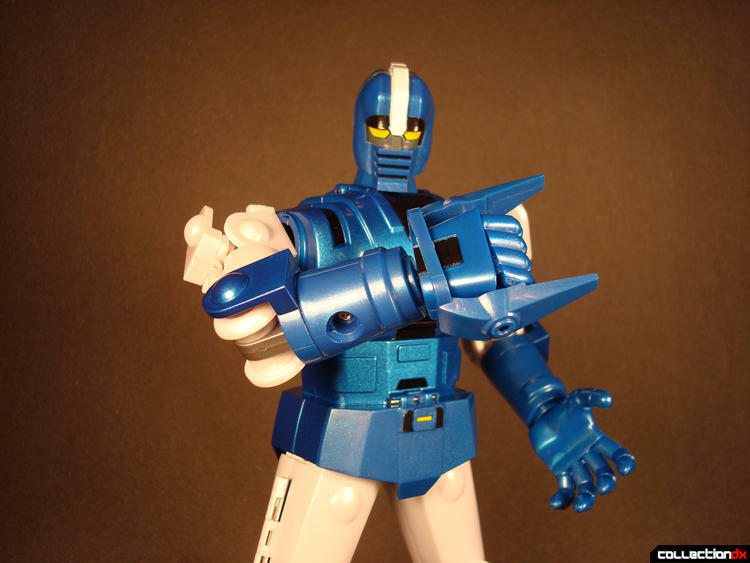 What good is a Gordian review without a picture next to Baikanfu, with an Iron Gear thrown in for good measure? I didn't want to list the plastics used as a con because the figure is too new to know if the plastic will become brittle and carry on the broken knee torch. Only time will tell. Bottom line and my opinion is that CM’s Garbin is a nice figure and I don't regret paying full price for it. I’ve paid good money for other robots only to feel buyer’s remorse after getting it *cough*Fewture*cough*Mazinger*cough*1969*cough*Repaint*cough*! It is too early to tell how reliable the plastics are but I am having tons of fun with the figure before it goes away to my display case. If you’re a fan of Gordian’s cartoon or design, then it might be worth your while to pick up either version. If past CM's Brave Gokins are any indication, however, you may be able to pick this guy up at a bargain price in about a year or so. I hope you guys found this review informative! When I first saw this review, I initially thought it was a rip-off of Baikanfu. I like the Normal ver. more. Yikes. This toy fills me with lust (I am not a proud man). I'm surprised at how little attention has been paid to this toy. This is an exceptional review, chachi. The graphics and diagrams are next level. Good work. Chachi, fantastic review. Much essential info, made as concise as possible. I LOVED reading this. I'm seriously getting swayed by this item. 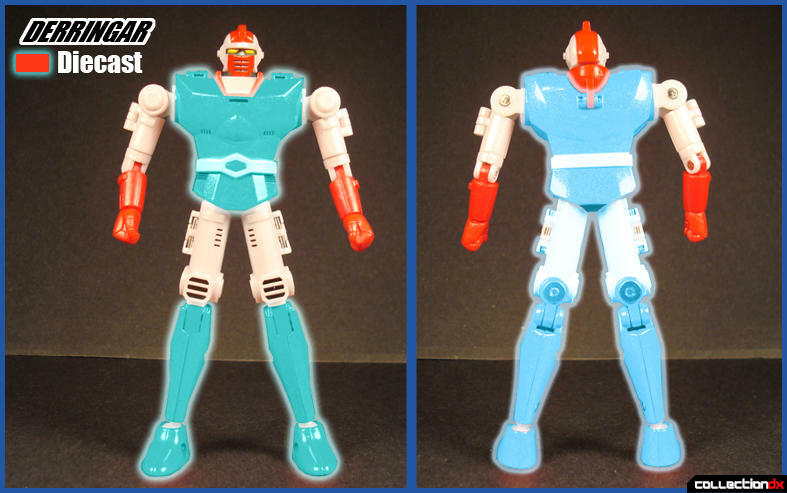 This is as close as possible to an actual re-release of the old Godaikin/Popy DX set. Totally out of the park hit. Compare your measurements to the vintage original. I was prompted to zing out the tape measure on the Godaikin, and the box is 18" x 13.5". 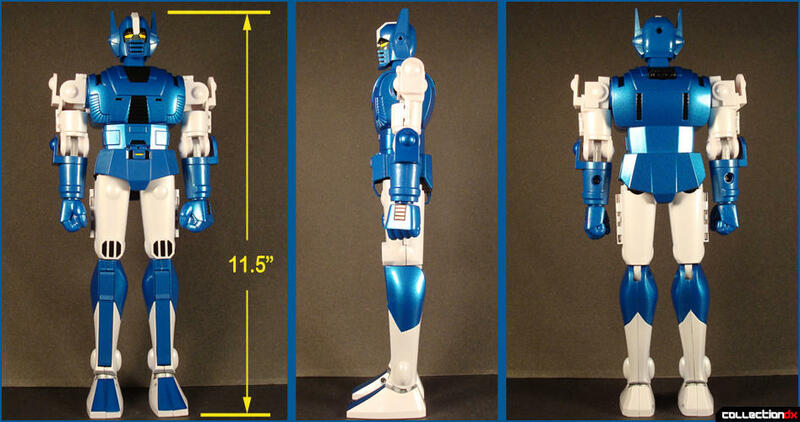 The Garbin robot is 11 3/4" to top of head, or 12" to top of "ears/antennae". The styro tray is laid out very very close to original. Awesome. Somebody's showing some love for the original. I love the limited's extra attention to detail looking more like the original, in the face, body, and paint, but that standard "anime style" version is great too. CMs could have easily gone the usual route and released this as a 6 1/2 - 8 1/2" tall figure, like a lot of their other great homage Gokins, but no, they went all out on this. Oh, and EVA, the Gordian, and Baikanfu, are from seperate shows, and the Gordian comes first. Many consider Baikanfu as the obvious update/improvement. Gordian has the chikka-bow-wow funk though, hands down. i think its a great toy. i think its a great toy. vintage old school feeling is definitely there. 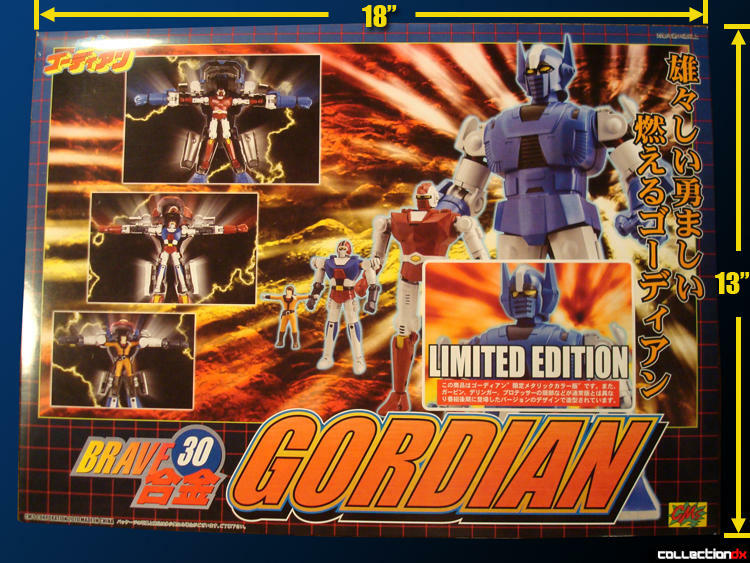 dont know much about Gordian but if i have the means, id surely get one. details and accessories are nicely done. nice review btw. Thanks for the positive comments guys, I tried my best at giving this guy a good a review as possible because he definitely is an overlooked robot. Whether it be for his looks, simpleness or obscurity. He was kind of an impulse buy for me at first but during the review and after, I really got to like this figure more and more. What strikes me is that for the first time in a long time I paid full price for a new release figure instead of waiting for price to fall and I don't regret it one bit. The execution of this release was one that just captures you attention when pulling it out of the box, handling it and playing with it. I'm pretty jaded when it comes to new stuff, Ive seen a lot in my lifetime, so it was good to see something that just made me say wow. I cant quite put my finger on what that "something" is, but it got me good. I am not a Gordian fan whatsoever but I enjoyed this so much. I particularly loved that it had a retro feel to it. Its so toy like in many ways that you just have to love it. If you arent a fan of the design or whatever, at least wait for a price drop and take a stab at one. This is the review I've been waiting for! I bought the Normal Version from HobbyLink Japan and I'm looking forward to buy the Limited Version too. The female pilot figure represents Saori Otaki, Daigo's sister who goes to her brother's rescue. She does this by piloting Protesser herself. As a result she suffers a lot of burns as Gordian was not intended for her but for her headstrong brother. 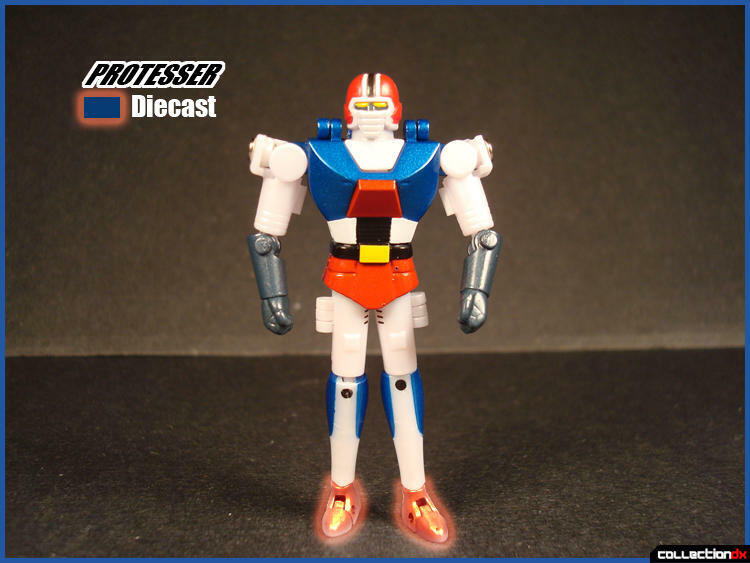 By the way, Protesser IS a robot footballer. Excellent review chachi. Thanks for sharing. yes, its the glowy parts, I kinda felt that was a bit confusing too so Ill dial it in a bit better next time. As a fan of diecast toys, I really appreciate how you clearly address metal content in your reviews. Great review. 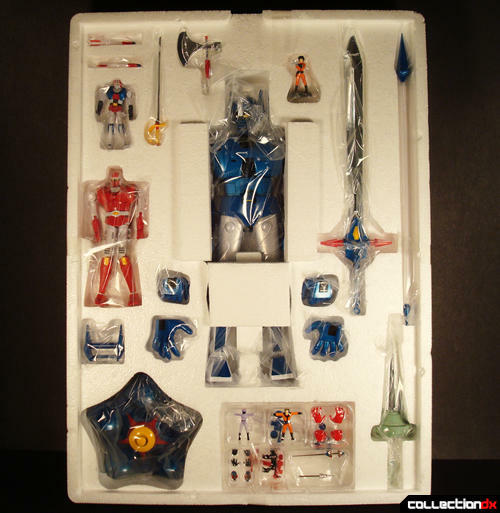 This is one of the few new toys that makes me regret not buying this stuff anymore. I definitely prefer the limited edition sculpt. The retro style is perfect for this toy. Here I am faced with a conundrum. While a price drop is almost a given for this toy, will there actually be any limited edition versions left for sale by the time that happens? On a different note, who's this Miyazawa guy, anyways? Just had to add a comment about the heritage, as many people rightly see the connection to Russian nesting dolls in this design. But...the Russians got the inspiration back in the day from an early, simple Japanese toy, just called a "stacking doll", that was like 4 small cups, of increasing size, stacked on top of each other, with basic human face features. The Nesting dolls obviously took it to the next level of fully containing each piece. So, the toy idea comes full circle Japanese. ...sorry, couldn't resist. There's a few history books on the toys at a shop near me, called, "The Nesting Doll Store". Not kidding. Great review! Really made me want to also get this version... but right now, one is enough. I did notice in the comments above that a lot of folks here keep refering to this version as the "Retro" version. However, this is not an accurate statement. This design of Gordian was an actual improvement to the "normal" version (first appearance) in the anime. Yes, this guy with the square mouth was in fact in the anime. 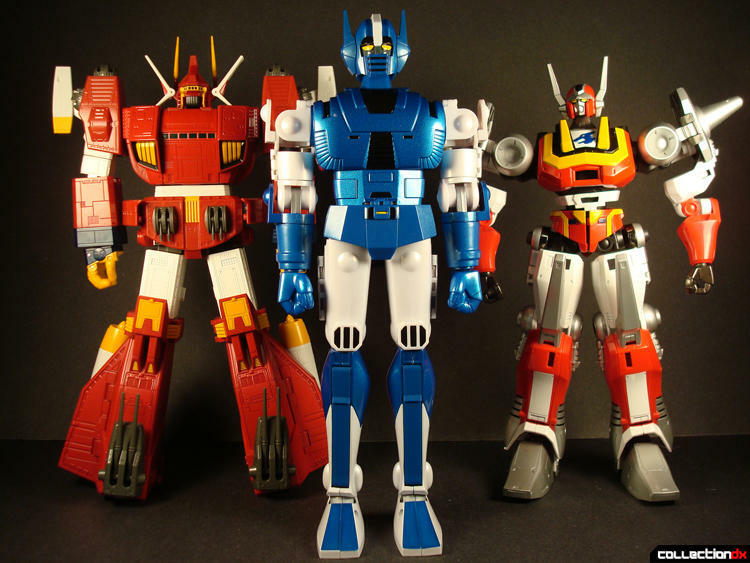 The Gordian Popy/Bandai put out in the Godaikin line was taken from the last episodes, hence the huge similarity with this one. I only recently learned this existed ( after buying Baikanfu ). The next thing I found out was it costs $500 now :( A real pity because it is a great design. 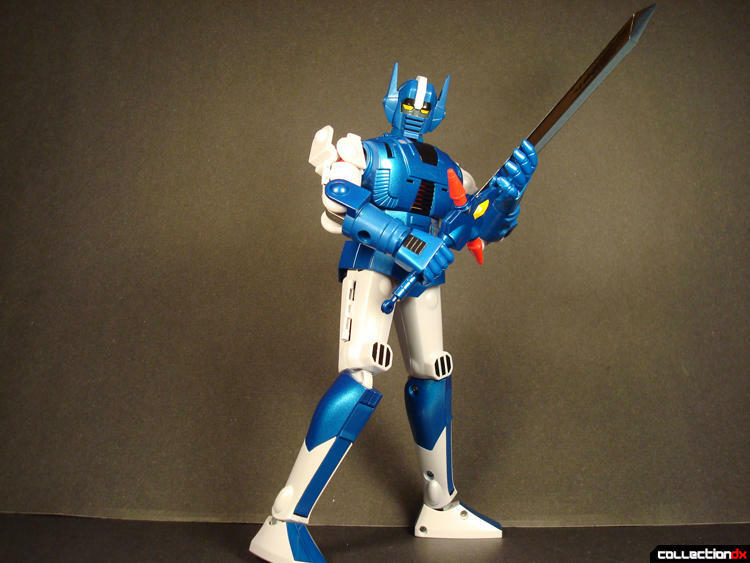 I like the way Baikanfu does it a bit better but I like the outer appearance of Gordian a little more. Great review.